“By wisdom the Lord laid the earth’s foundations, by understanding he set the heavens in place” - (Proverbs 3:19). When we take time to look at the world around us, we become aware of all the work we have to do as believers. The dying world in which we live is desperate for the Gospel. It needs to hear the Truth of God’s Word. Truly, we have our work cut out for us. However, in all our striving to advance the Kingdom of God, we sometimes forget one of the biggest truths of God’s Word. On the cross Jesus said, “It is finished” (John 19:30). The work which He came to do, to fulfill God’s promise to mankind by making the ultimate sacrifice for the sin of the world, is finished. In our hearts, the work of the Holy Spirit to bring us to completion is still taking place. Once we submit our lives to Jesus, the process begins and does not end until we get to heaven. Yet, we are not called to finish Jesus’ work because His work is done. We are called merely to allow the Holy Spirit to complete His work in us as we share with ohers the Good News through both our words and actions. It is not up to us to finish the work that only God can do in our lives. We cannot live a holy life without Him. His gift of salvation can only be received through faith in His Son. Strive as we may, eventually we will stumble. But God has promised to do what we cannot do for ourselves. He has sent His Son to save us. While we can look forward to the day when God looks at us and pronounces a completion of His work in our hearts, we must remain faithful and allow the Holy Spirit to continue His transforming work in our lives. Seek the Lord above all things. 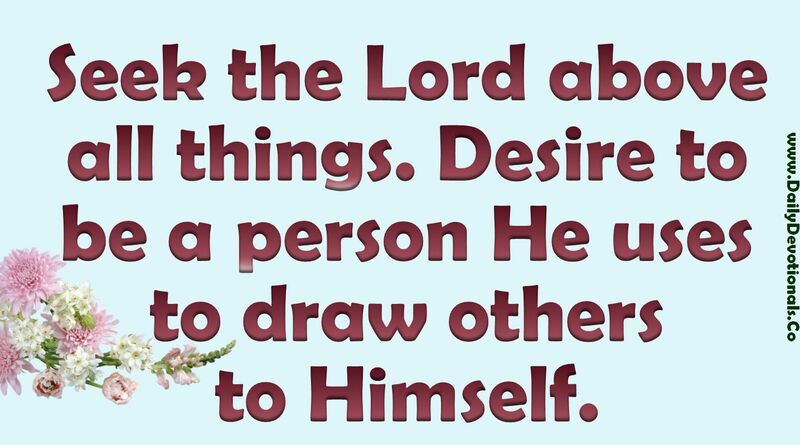 Desire to be a person He uses to draw others to Himself. Prayer: Our Loving Heavenly Father, thank You for the work You have started in me. Please continue shaping me into the person You want me to be. Thank you for hearing and answering my prayer. Gratefully, In Jesus Loving Name I Pray, Amen."